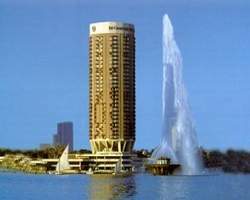 The El Gezirah Sheraton Hotel, Towers & Casino, located on the southern tip of the El Gezirah Island on the River Nile, is a unique resort within the city. Located within walking distance from the Opera House, the world famous Egyptian Museum, the city's shopping district, business centers and major government ministries, the hotel offers breathtaking views of the Nile, the Pyramids of Giza and the Cairo Citadel. It is a five star hotel open all year, offering breathtaking views of the Nile, the Pyramids of Giza and the Cairo Citadel and consists of 447 rooms and suites. Guest rooms do have all the amenities one might expect, including private balconies, in-room safe, data port, television with cable and satellite, in house movies, hair - dryer , direct dial telephones, air conditioning, of course private baths and non smoking rooms. An elegant restaurant serving gourmet specialities with classical entertainment and a panoramic view of the Nile. Cairo's most sophisticated night spot with top international shows, a live band, a belly dancer, serving international and oriental cuisine. Instant direct check-in at a separate area on the 23rd floor offers complimentary breakfast, pastries, evening canapes, coffee and tea.